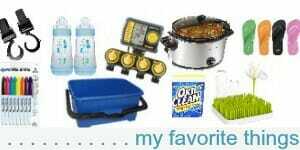 Remember… about a month ago, when I shared 10 tips for bringing food to potlucks or other holiday-type parties? Do you also remember when I shared that I rarely ever take lettuce salads to potlucks because they are nearly impossible to make ahead and they won’t last as leftovers? The party was on a day I was going to be gone and/or very busy most of the day so I knew I wouldn’t have much time to prep anything that day. I also didn’t have time to get to the store before making my food — so yes, my options were slightly limited! I did a little searching around on Google, Pinterest, and AllRecipes.com, and I came up with a SUPER SIMPLE, make-ahead, taste-great-as-leftovers, lettuce salad that just so happened to taste fabulous. Oh, and best of all, the ingredients can easily be swapped in and out depending on what you have in the fridge! This Layered Lettuce Salad was a huge hit at our party — I actually ended up making it again for Dave’s family party, and we enjoyed the leftovers for a couple days after. 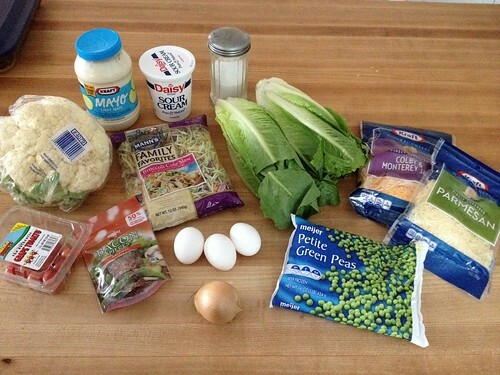 **These are approximate measurements of the ingredients I used based on what I had in my fridge. Please feel free to mix it up with any of your favorite salad toppings. pretty much anything you like eating on a salad! I can confidently say (after personal experience) that this salad tastes fabulous even when made the day before — and honestly, I ate some of the leftovers 4 days later and it still tasted very fresh. 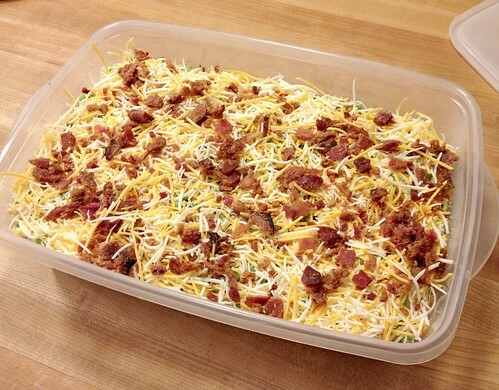 This 9″ x 13″ salad took me less than 10 minutes to whip up and was WELL worth the effort. I just love that I finally have a lettuce salad I can make ahead of time, customize to the ingredients I have in the house, and enjoy any leftovers that don’t get eaten (instead of throwing it away). As I mentioned above, feel free to mix and match your favorite salad toppings. 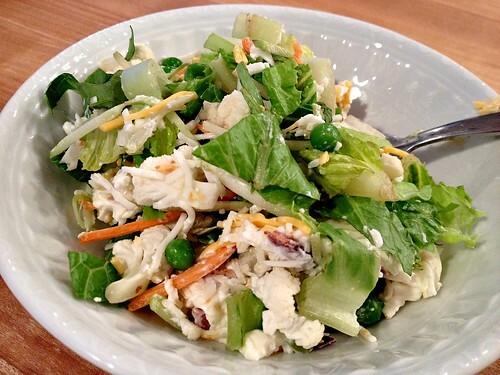 And if you don’t like the idea of a mayonnaise-based dressing, leave this dressing off and instead, serve this salad with your own favorite store-bought or homemade dressings — however, if you do this, I would keep the dressing separate instead of pouring it over the top. You really can’t go wrong with this simple recipe! Do you have any other make-ahead salad recipes? Made this salad this weekend for extended family. Left off eggs (husband hates), but added raisins which he loved. Great recipe for entertaining. Was delicious next day for lunch! thanks for coming back to share your feedback Sharon! I LOVE this salad for leftovers and am always bummed if it’s completely gone after the first meal! This may be a silly question – after you layer it all and add the dressing on top, do you mix it all together or just let it seep into the salad and it’s mixed in before you serve it? 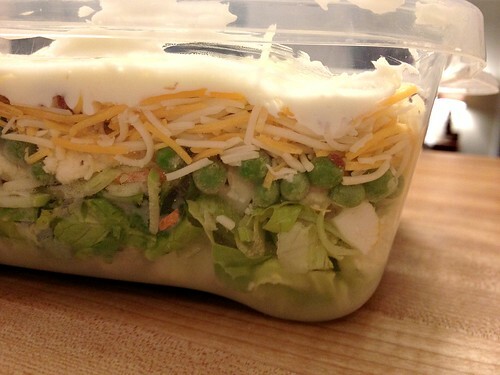 the dressing is just one of the layers — it just sits on top and I don’t ever mix it in (not even before serving). You just scoop out the salad as-is and the dressing is the top layer. It sort of mixes in when you scoop it onto your plate. 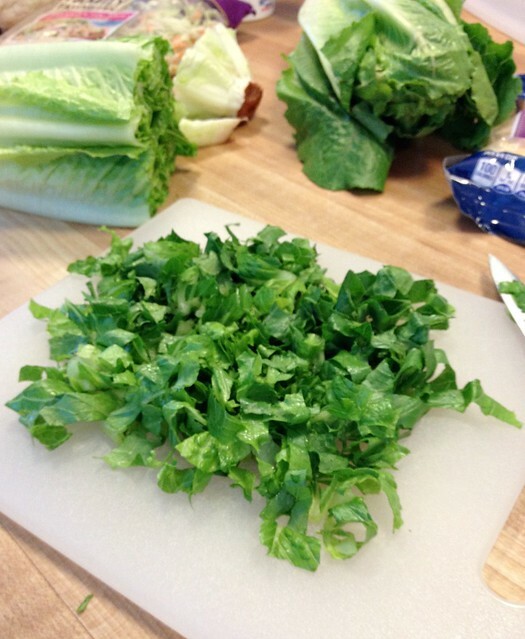 Silly question… regarding the cutting of the romaine…I notice you are cutting the romaine still attached which is very efficient. But how do you wash the lettuce? I’ve always separated and washed the leaves first then cut them. Is there an easier way? My mom has been making this for a few years now (no cauliflower, and added water chestnuts) and it is delish! 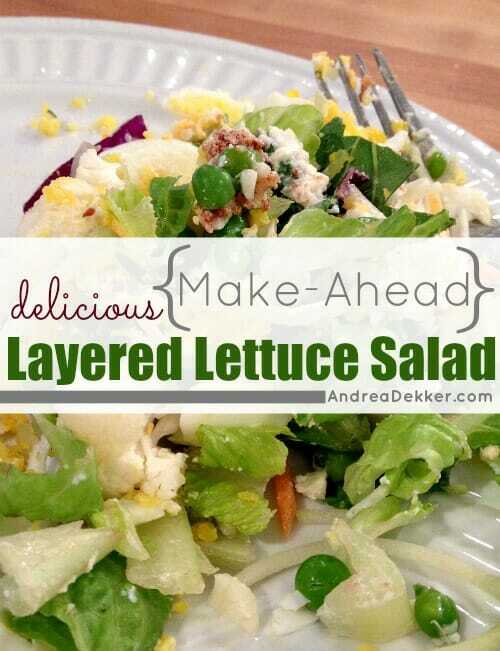 Everytime she invites my family over for dinner, I let her know that I’m expected the layered salad! Every one needs to try this. I LOVE it! Just need a little clarification–do you need to thaw the peas before adding to the salad? I’m thinking that when they thaw, it might make the salad watery. 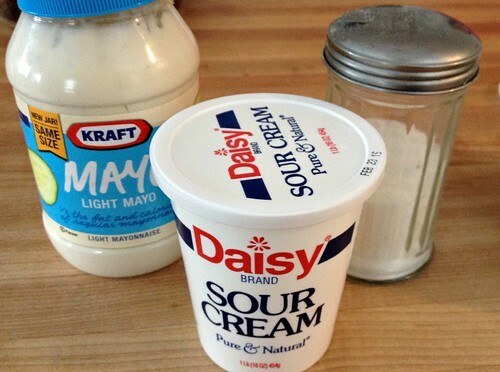 I add a package of dry Hidden Valley ranch mix to the mayo/sour cream mixture. Adds great flavor! I like this idea. Kind of like a seven layer salad. 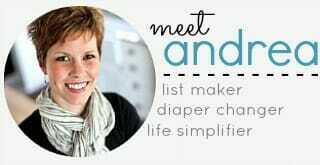 While reading it, I had the idea that I bet you could layer the ingredients in quarts jars and have several salads ready for the work week. Yes, you could definitely put it in separate containers for lunches. The only think you might need to do is “stir” it really well before you eat so the dressing gets mixed through. 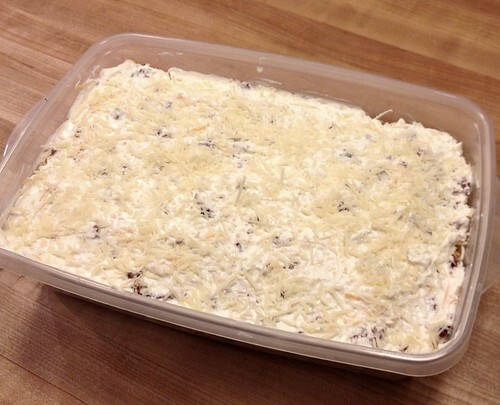 I prefer making it in a flat dish so it’s easy to make it through ALL the layers with each bite! I’m going to give this a try…..
Also~ LOVE Love LOVE they way you present your recipe! Thanks for this easy healthy idea! This is an awesome salad and I’ve made a version of this for a number of years. 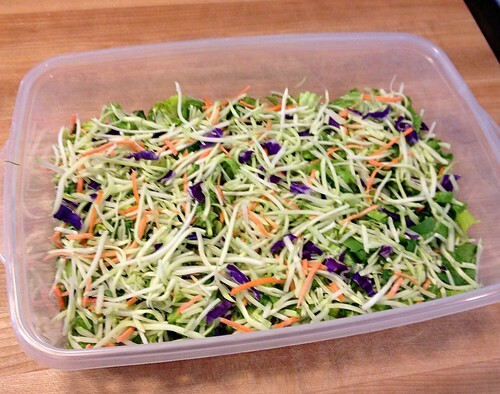 One tip for making this salad the day before is to chop the lettuce with a plastic knife or just tear the leaves. If you use a metal knife the leaves may turn brown at the edges. It doesn’t change the taste but it also doesn’t make your salad look as fresh. Good tip Sherry. I didn’t even think about that — but I used a ceramic knife (so not metal) and maybe that’s why my lettuce stayed so fresh looking! Definitely going to try this. I always receive many compliments when I try your recipes!